Choosing the right job after earning your MBA is always intimidating. The degree opens a multitude of paths for professionals entering the marketplace. However, the sheer number of available options can be a double-edged sword, and it is important that b-schoolers do their due diligence to find the right company and career track for them. For those looking to work at a company with a rich history, New York Life Insurance Company may be the right choice. Not only if New York Life one of the US’s oldest Fortune 100 companies, the company consistently makes Fortune’s list of the “World’s Most Admired Companies.” Below, we’ve laid out some of the opportunities available to MBA’s looking to work at New York Life Insurance, so that you can gauge whether it might be the right fit. Two possible tracks for those seeking employment with New York Life: as agents, or as a member of the corporate team. There are many options for aspiring New York Life Agents. There are entry level positions for new agents looking to grow their business and gain experience and knowledge of the field. More experienced agents are also encouraged to apply. Experienced professionals can also apply for a sales management/partner position. Those in this position will oversee the recruitment and development of sales teams. Though opportunities for non-MBAs abound, MBAs are at a significant advantage here. Those who have completed their MBA within 24 months are eligible for the management fast-track, a program wherein select employees can advance to management within a year of being hired. These hired will take on roles as Associate Partners once they have met training requirements. It should be noted that New York Life prefers for fast-track applicants to be Life and Health licensed, have some previous sales experience, and have FINRA registrations of Series 6 or 7 and Series 63. 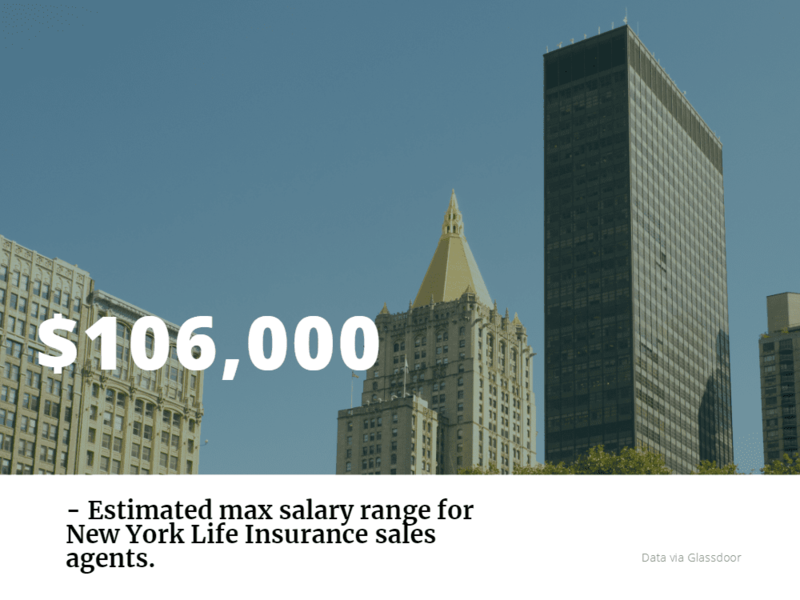 What Kind of Salary Should You Expect at New York Life Insurance? The salary of New York Life Insurance agents can vary wildly, considering commission is significant portion of the career incentive. According to Glassdoor data, base-level agents can expect a total annual pay of $51,322. This includes salary (around $42,000), plus benefits, commission, and more. Of course, an advanced degree can greatly increase annual compensation, with some agents earning over $100,000 per year. Those seeking to enter the corporate side of New York Life also have plenty of options. With over 9,000 corporate employees, there is a position for nearly every type of business-minded application. Whether you want to work in marketing and communications, technology, sales support, investments, leadership and management, or a host of other fields, New York Life offers plenty options and support. PayScale data indicates that several MBA-level positions offer obvious lucrative benefits. The average marketing manager at New York Life, for instance, makes an average annual salary of $83,729. This is early double the amount administrative assistants and client services representatives make. New York Life offers several internship opportunities based on the company’s specific needs. However, the company has a couple of specific programs tailored for interns. For those with an interest in actuarial studies in their junior or senior year of undergrad, or pursuing their MBA, the Actuarial Summer Internship Program may be a desirable option. In this program, interns receive projects from each area of the company actuarial departments and work alongside full-time actuaries. They receive training in the relevant software, meeting with the other interns every two weeks to touch base. They also benefit from monthly presentations by the New York Life actuaries, and a variety of social events. Profile Magazine recently highlighted the company, called, “How An Inclusive Culture is Reshaping New York Life.” The article highlights New York Life’s active efforts toward inclusivity, as well as the loyalty of the company’s employees, and the ethical approach the company takes to serving clients and the community.